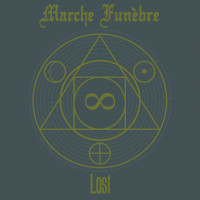 The Belgian Death/Doom Metal band MARCHE FUNÈBRE is back with a pre-taste of things to come in 2016: the 7″ vinyl “Lost”, which contains two tracks. The first is a new one, “Lost (In The House Of Doom)”, the second is a re-recording of “As In Autumn”, which can be found in its original version on the band’s last album, “Roots Of Grief” (2013), whose review you can find here. Before the making of this 7″ (only 100 hand-numbered copies), the band played throughout Europe, sharing the stage with many great bands (ABORTED, MOURNING BELOVETH, SATURNUS, AHAB and more). Now, they’re ready to take their music to the next level, hence working with Markus Stock (EMPYRIUM, THE VISION BLEAK). This resulted in a more powerful sound, a little warmer, too. MARCHE FUNÈBRE will release its third full-length later this year. Maybe they had better put it out last year, in 2015, to follow the previous albums in their two years’ pace: “To Drown” in 2011 and “Roots Of Grief” in 2013. but it is what it is and this little appetizer is a nice offering to bridge the gap. “Lost (In The House Of Doom)” begins with a typical Doom sound and composition: slow, just the guitar and a few cymbal accents. But then hell is unleashed with pounding Death/Doom Metal. Just as an appetizer, because the calmness of before returns. But the appetizer was nothing, for the beast does strike with vile, vicious vocals and powerful metallic sounds. Contrast is created in the chorus, preceded by a bit of Doom, to ease the transition. In the chorus, you’ll find no growls or screams, but clean singing. Clean! Even the music isn’t as aggressive anymore. Contrast? Different as night and day! It does take a few listens to appreciate this change, though. The obligatory solo is nothing fancy, but blends in perfectly. In short: hats off for this new effort. The re-recording of “As In Autumn” sounds heavier, fuller, … than it’s original, even if that too already sounded very good. MARCHE FUNÈBRE show once more they’re one of the best Belgian bands, creating qualitative Doom Metal. They will work again with Markus Stock at his Klangschmiede Studio E to make their third album sound as good as this “Lost” release. In the meantime, the fans can buy this little 7″ without fear.